The National Institute of Standards and Technology (NIST), in collaboration with the Centers for Disease Control and Prevention (CDC), has developed Standard Reference Material (SRM) 2669 Arsenic Species in Frozen Human Urine. SRM 2669 is intended for method validation and quality assurance in the National Health and Nutrition Examination Survey (NHANES) and other similar assessment of human exposure to arsenic. In biennial NHANES conducted by the CDC, the exposure of U.S. population to arsenic is assessed by measuring arsenic species in urine. A toxic element and a known carcinogen, arsenic is present in the environment in many chemical forms or species. The toxicity of arsenic species varies widely. An accurate assessment of arsenic exposure must be based on the quantity as well as the speciation of arsenic. Arsenic exposure in the U.S. population is an important part of the NHANES program conducted by CDC because dietary exposure to arsenic can cause serious health effects. A major challenge in the arsenic exposure assessment is that arsenic exists as various species in nature, and the toxicity of these species varies widely. An accurate assessment of toxic exposure to arsenic must include both the quantity and the speciation of arsenic. SRM 2669 has been developed to meet this need and challenge. In the NHANES studies seven arsenic species are measured in urine, which is considered the best proxy for recent (one- to two-day) arsenic exposure. Arsenic in drinking water, which is limited to 0.01 mg/L by the Environmental Protection Agency (EPA), is in the most toxic inorganic forms of arsenite (AsIII) and arsenate (AsV). Food intake is the greatest source of dietary exposure (about 25 to 50 µg per day); however arsenic in foods such as fish and shellfish is typically in organic forms such as arsenobetaine (AB), arsenocholine (AC), and arsenosugars that are essentially nontoxic. In addition to the species associated with dietary exposure (AsIII, AsV, AB, and AC), the seven arsenic species measured in NHANES also include the metabolites of inorganic arsenic: monomethylarsonic acid (MMA), dimethylarsinic acid (DMA), and trimethylarsine oxide (TMAO). With certified values for all seven species at key levels, SRM 2669 is the first reference material to contain primary arsenic species of dietary exposure and their metabolites in one material, which makes it most suited as a quality assurance material for arsenic exposure measurements. The reference material is the first to contain As(III) and As(V) species, the most toxic and most important for assessment of arsenic poisoning yet most difficult to stabilize. Because the matrix of the reference material is natural rather than processed (e.g., freeze dried), the product is better suited for the intended purpose of validating the accuracy of methods for urine analysis. Conducted preproduction research and developed production and storage protocols that ensure the stability of the SRM. Certified seven arsenic species in the SRM through interlaboratory collaborative measurements. In the feasibility study for developing a urine reference material containing the seven arsenic species, stabilization of the arsenic species emerged as a critical challenge. As(III) was oxidized to As(V) under normal storage conditions in the laboratory, and it was discovered that oxygen in air was the cause. Stability of the SRM requires oxygen-free production and storage environments, and storage must be at the lowest available temperature to minimize the rates of species conversions. NIST and CDC staff jointly produced SRM 2669 at the CDC facility in Atlanta, GA. To ensure the stability of the SRM, candidate urine materials were sparged with nitrogen for removal of oxygen. Next, the SRM vials were filled under nitrogen in glove boxes. 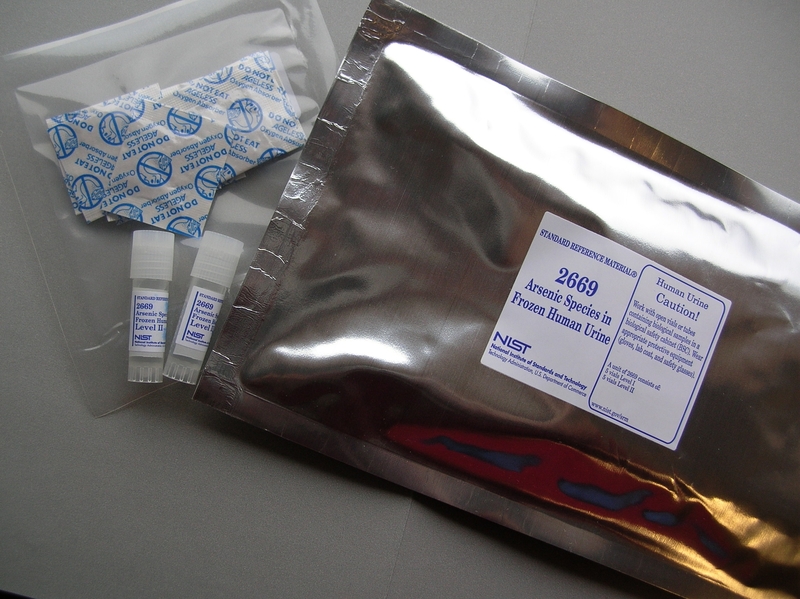 The SRM was packaged in sealed, gas-impermeable Mylar bags that contain an oxygen absorber. The finished products were stored in –80 ºC freezers. Because primary references are not available for all of these analytes, we developed our calibration standards from commercially available arsenic compounds by subtracting impurity species (measured by liquid chromatography inductively coupled plasma, LC-ICPMS) from total arsenic (measured by instrumental neutron activation analysis, INAA). SRM 2669 was certified using data provided by NIST, CDC (Atlanta), and Rutgers University.